- See more at: http://blogtimenow.com/blogging/automatically-redirect-blogger-blog-another-blog-website/#sthash.UVsgb4Gv.dpuf Erin's Alter Ego Writes Books: Whuddup? I've been so bad. Sorry guys for not being here, even when I said I'd be back in my last post. I've had a whirlwind past few months, filled with job-changing, life-settling, and stuff like that. Still no excuse, I know. But I won't dwell on the past. Onward and upward, as I've been telling myself. 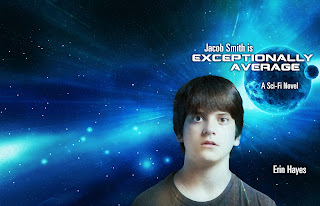 Jacob Smith is Exceptionally Average is with its editor, hopefully getting some magic fairy dust that will make it into the book I know everyone will love (my friend Emily did a first editing pass, and really thinks it has potential, fingers crossed). I've also been planning out its two sequels. Don't worry, the first book is entirely standalone, so you'll only have to commit to one book. But I promise you, I have some big plans for Jake Smith. With that said, I'll do a cover wrap reveal of the book in all its glory. I'm quite pleased with it, because even though I had some severe limitations, I didn't have to compromise too much on my vision of it, so I'm really happy. I do one day want to use the fabulous PhatPuppy Art, but that may be a while. Once I get the final dimensions of the thickness of the book, I'll be able to add a spine and the back copy. Here goes the book cover. If you're a book blogger and are interested in reading an ARC of Jacob Smith please email me and I will lovelovelove you forever. I'll send you a physical edition of the book, plus anything else to promote it. Dress me up like a monkey, record me singing "My Heart Will Go On" - anything if that makes reading and reviewing my humble little book more enticing. I will embarrass myself to make it work. Hmmm... What else? I have a few cooking stories to share, at the behest of my friends Cbel and Sam. Where do you guys think I should start? I have an idea. And that will be the next post. FYI for those who don't know, I'm an absolutely terrible cook. Worst part is, I actually try. Just something about substituting, not following the recipe, not get it. I blame my cooking equipment, but I don't think that's it. I don't know. All I have to say is "chutney" is not "curry". And that'll be my next blog post. I promise. Gimme two days and a glass of winter cider and I'll have it up here. I won't leave you guys hanging for so long again. Promise.